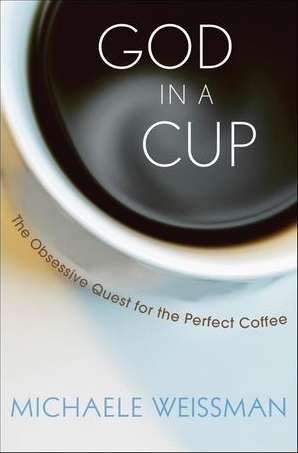 God in a Cup, published in 2008, is food journalist Michaele Weissman's journey deep into the specialty coffee industry. She begins the book by relating her first revelatory experience of amazing coffee - a fitting way of introducing her progression from ignorance to fascination with quality coffee and the industry based on it. In a sense, we are given the perspective of an outsider to the specialty coffee industry as she is invited into it. The book is structured around Weissman's developing relationships with three major players in the US specialty coffee industry - Geoff Watts from Intelligentsia, Duane Sorenson from Stumptown and Peter Guiliano from Counter Culture Coffee. These are the rock stars of the coffee world. But whether you've heard of them or not doesn't really matter; Weissman describes her own introductions with these guys in such compelling narrative that I think any reader will have a sense of who they are and why their stories are worth hearing. If you're anything like me, you'll probably pick your "favourite" of these guys, and diss one or both of the others as their stories intertwine! But why are their stories worth hearing? In a sense, these "coffee guys", as Weissman refers to them, are the explorers of the New World of specialty coffee. They have been pioneers of things like direct trade (ie. sourcing coffee directly from growers and developing relationships with them over many years), promoting education of coffee consumers through complete transparency, and the introduction of super-premium coffees such as Panama's Hacienda La Esmeralda Special to the US market. Weissman examines the obsession to coffee these guys have. The Third Wave (which includes the Big Three profiled by Weissman) essentially built upon the work of the Second Wave and take a further step towards the origins of great coffee by emphasising things like direct trade, microlot coffees, and experimental processing techniques. The interesting thing about this debate is that it is a generational one. Twenty years ago, the Second Wave would have been producing the best coffee available; they were cutting edge. Now, in a time when Starbucks Coffee is seen as anything but specialty, the Second Wave's "cutting edge" is looking pretty dull. But this doesn't diminish what they managed to achieve - which is an accusation felt by some of the Second Wave guys. The key question, they might ask, is not whether or not a particular coffee is 100% Pacamara varietal, or miel processed, or harvested on such-and-such a date... the key question is, does it taste amazing? I think this is a great question in an industry so rife with fads and phases. --- I'd definitely rate this book highly and recommend it to anyone interested in learning more about coffee. To those in the industry, I think it should be required reading!